We eat a lot of soup in my house. Recently, I wanted to make soup from a recipe. This is a departure from the norm for us. Usually Tom makes our soups, starting from the broth he periodically fabricates from the contents of his two-gallon freezer bag of broth fixings – fresh vegetable trimmings, poultry and beef bones, leftover gravies, and similar flavorful odds and ends. On a soup-making day he takes some of that broth from the freezer and adds whatever he finds in the pantry and refrigerator – fresh or leftover vegetables, meats, or tomato sauces; fresh or cooked rice, beans, or pasta – and produces a hearty soup. His soups are always good, but they all have a strong family resemblance. Hence my revolutionary wish to make something different for a change. 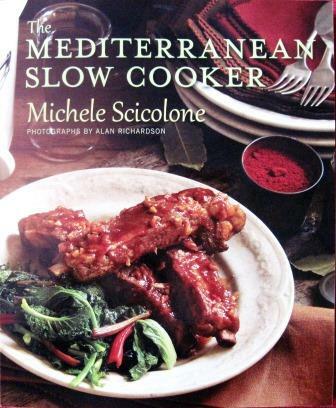 That happened when my friend Michele Scicolone gave me a copy of her latest cookbook, The Mediterranean Slow Cooker. I neither have nor want a slow cooker, but I’m always interested in Michele’s recipes, and any dish that can be made in slow cookers can be made in ordinary pots. I started by looking at the book’s soup section. Those recipes cover a lot of Mediterranean geography – Spain, France, Italy, Greece, Morocco, North Africa, and the Middle East – with a nice mixture of familiar and exotic dishes. My eye was caught by one of the exotics: Harira, a type of soup that’s made in several Islamic countries, where I understand it’s a traditional thing to eat at the end of the all-day fasts during the holy month of Ramadan. It’s made with chickpeas, lentils, and pasta, plus a lot of spicy seasonings. Sometimes meat is added, but Michele’s recipe is vegetarian. It was an excellent soup, but very thick. I could have added water at the end, but it smelled and tasted wonderful as is. Each spoonful made you want to hurry and take another. The effect was somewhat like the recipes for pasta with chickpeas and pasta with lentils that are in my book The Seasons of the Italian Kitchen, but the seasonings here were very different and much more insistent. In fact, I was a little concerned at first by how strong a sweet cinnamon aroma the soup exhaled by the end of the cooking time, but it mellowed in the taste. The turmeric and pepper lent a warm spiciness to the two mild pulses, and the cilantro gave everything a pleasant herbal lift. This harira would definitely be a satisfying dish to sit down to at the end of a whole day without food. It makes a good lunch too, as well as a fine first course for dinner – a welcome addition to our household’s hearty winter soup repertoire. Even Tom concedes its pleasures. Toward the end of each year, as the weather declines from chilly to frigid, I start thinking of long-cooking, rib-sticking legume dishes, based on beans and lentils. I have good French, Italian, and American recipes for these pulses, but this week I was feeling global, so I looked in my cookbooks for something more exotic. I also happened to have in my pantry superior varieties of both brown lentils and white beans. The lentils – small, tender, golden brown – are from Castelluccio, in Italy’s Umbria/Marche region, by way of a shop in Torino. The beans are alubias, an heirloom variety from Guanajuato, Mexico, by way of Rancho Gordo. In one sense, it was silly to try to do anything exotic with either of these, since they’re both marvelously flavorful just in simple preparations from their home regions. But I had culinary Wanderlust, so I looked farther abroad. 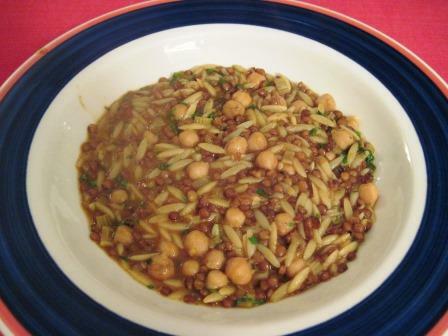 For the lentils, I went as far as the Arab Levant, using Clifford Wright’s book A Mediterranean Feast. 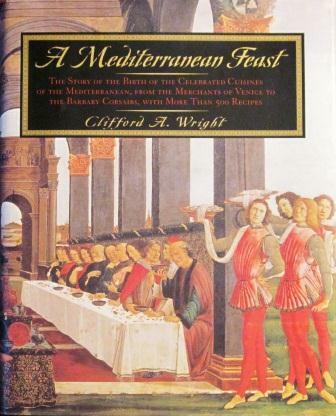 This is an imposing tome of gastronomical history, as indicated by its subtitle, “The story of the birth of the celebrated cuisines of the Mediterranean from the merchants of Venice to the Barbary corsairs, with more than 500 recipes.” Mujaddara is a rice and lentil pilaf recipe, a traditional dish in Lebanon, Syria, and Palestine. 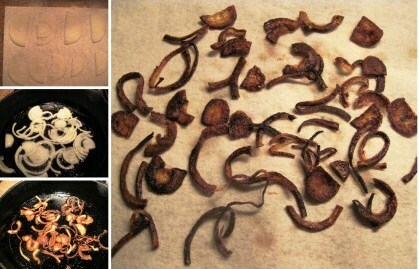 The recipe starts by having you fry a batch of onions to top the eventual dish. I have to say the instructions for the onions gave me pause. The author seems to think you can slice onions less than 1/16” thick, toss them in hot olive oil, fry them until dark brown, and still have them hold together as slices. Has he ever actually tried this? It can’t be done. The onions immediately fall apart, as my photo of the frying stages shows. But the general technique is close enough to the way Indian recipes brown-fry onions, so I just did it that way and didn’t worry about their shape. Then you boil lentils in water until they’re almost tender, and set them aside. Soak rice in water for half an hour, and drain it. This rice preparation is again very like the way Indian recipes treat basmati rice, but this author didn’t specify a type, so I used long-grain Carolina. Finally, you sauté a little freshly chopped onion in butter, add boiling water, salt, the lentils, and the rice, and cook until the rice is tender and the water all absorbed. Transfer to a serving dish and top with the fried onions. It was good. Mild tasting at first, but it grew on us as we ate. With the rice and lentils combining to make a complete protein, we could practically feel the nourishment we were getting! 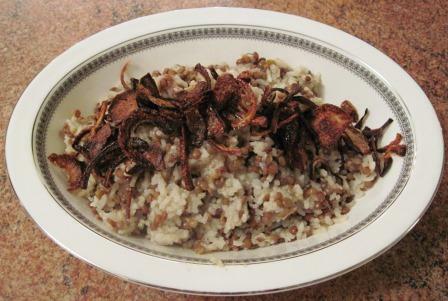 The lentils were definitely the star of the dish, because the rice had gotten a little pulpy from the soaking. So if I do it again I’ll either reduce the proportion of rice or use basmati to see if it contributes more to the flavor and texture. 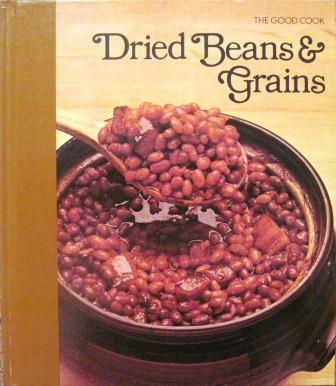 I found my bean recipe in the Dried Beans and Grains volume of the Time-Life Good Cook series. Translated as Spiced White Beans, it’s a dish from Morocco, or more generally, North Africa. The recipe looked perfectly easy to make, and so it was. After an overnight soak (or a two-minute boil followed by a two-hour soak in case, like me, you forget about the beans the night before), the beans are cooked in plain water until nearly tender. Meanwhile, you make a heady paste of garlic, cumin, cloves, paprika, cayenne, salt, and olive oil, and then simply stir it into the beans for their last 20 minutes of cooking. That’s all there is to it. The dish looks pale and plain, but it was enticingly fragrant, and the unusual (for me, at least) blend of spices made it a delicious accompaniment to broiled lamb chops. The fleshy beans, flavorful in themselves, picked up different nuances from the seasoning and tasted slightly hot, slightly herbal, and slightly fruity – sometimes all at once, sometimes sequentially. Very intriguing. At the outset, one thing about the recipe had struck me as improbable. For six servings it called for four cups of dried beans. At the rate they expand when cooked, that would yield almost a cup and a half of cooked beans per person. A mighty hefty portion, unless the beans are meant to be the entire meal! 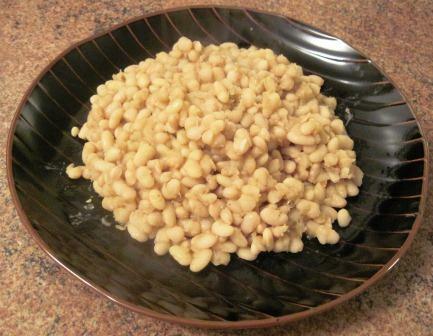 I decided to make the dish with only one cup of dried beans, which would be more than enough in a full dinner for two. But the amounts of spices called for in the recipe were quite modest, mostly just pinches. Using only one-quarter of them didn’t seem as if it would do much for my good-sized pot of cooked beans. So I approximately halved the spices, and that worked out quite well. Maybe Moroccan chefs’ fingers take bigger pinches than mine do! Tom took the leftovers of both dishes and made an excellent soup of them, adding a little sautéed carrot, onion, and pancetta, and then his homemade broth. Ingenious fellow, my husband.